If you are planning to use Successful Marina with computers/mobile devices that belong to the categories 2, 3 or 4 above, you will need the Cloud version of Successful Marina (see table below). If your computers/mobile devices belong to the category 1 above, then you may choose between the Cloud version of Successful Marina and the Locally hosted version of Successful Marina (see table below). 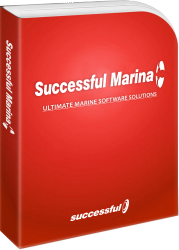 If you want more information on the technical specifications your Windows computers must have in order to work with Successful Marina, please click here. Notes: Use Successful Marina as an online software solution (SAAS or Software As A Service). This option makes sense for smaller organizations with limited budget. Successful Marina Cloud runs on our servers which your local computers (desktops, laptops) and mobile devices (smartphones, tablets) connect to via the Internet. We buy, operate and maintain the servers and the software with the necessary updates. You pay an up front fee for the initial setup of your account and a monthly fee for the use of the service from that point and on. Minimum contract period is one (1) year. You can stop using the service anytime you want. No refunds are made. This option requires a high speed Internet (non satellite) at your marina-boatyard for the system to work. The mobile devices (smartphones, tablets) that you intend to use must have an Internet browser that is capable of HTML5. Notes: Invest in Successful Marina by buying one or more licenses of the system according to your needs. This option allows you to run Successful Marina locally on your own server/computers and it is ideal for medium to large organizations. You pay for half the cost of the software to setup it up and prepare it for "first time use", and half upon delivery of the system on your server/computers. Are you ready to give Successful Marina a try? Contact us today for a FREE business needs analysis of your business from a marine technology expert followed by a quote.